FROM NUMBER 157 SAJ IS AVAILABLE THROUGH THE ADS BY COURTESY OF THE SYSTEM'S HOLDERS. *Please use DOI number to cite OnLine-First articles! Professional Papers - articles offering experience useful for the improvement of professional practice i.e. article describing methods and techniques, software, presenting observational data, etc. In some cases the journal may publish other contributions, such as In Memoriam notes, Obituaries, Book Reviews, as well as Editorials, Addenda, Errata, Corrigenda, Retraction notes, etc. Serbian Astronomical Journal is published biannually, in June and December. Submissions are accepted on a continuous basis throughout the year. 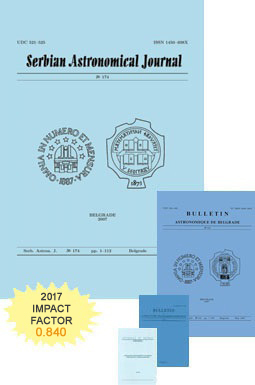 Contributions to the journal are published in English, with summaries in Serbian. For more details see editorial policy. By submitting a manuscript authors warrant that their contribution to the Journal is their original work, that it has not been published before, that it is not under consideration for publication elsewhere, and that its publication has been approved by all co-authors, if any, and tacitly or explicitly by the responsible authorities at the institution where the work was carried out. Authors must follow the instructions for authors strictly. By failing to meet the publishing requirements and quality standards, the authors risk that their manuscripts would be rejected without review. For more details see the author guidance. The more specific instructions are available upon request. It is also possible to download a complete example of a paper written in the present journal style HERE. The manuscript should be prepared in LaTeX and follow the style used in recent issues of the journal. LaTeX file, PDF generated from the LaTeX source and figures that appear in PDF, should all be included in submission as separate files. Use full journals abbreviations when preparing references. Each manuscript that meets the standards is peer-reviewed. The review is single-blind. By default, one reviewer is engaged in the process. The reviewer will in most cases ask for revision of the manuscript before he/she recommends it for publication. If revised manuscript has not been received within three months it will be considered withdrawn. As soon as the refereeing process for a submission is completed, the manuscript accepted for publication, and editing and proofreading finished, the article will receive its unique Digital Object Identifier (DOI) designation and be published as Online-First and available through SAO/NASA Astrophysics Data System (ADS). When the whole volume is complete, volume and page numbers will be assigned to the article. Before the article can be published, the authors are required to sign the license agreement. Authors have to use keywords from the list wich is common to the major astronomical and astrophysical journals. Download the list in html, pdf or ps format. Subscription rate for printed edition per year is $50. For Serbia: individuals RSD 1500, institutions RSD 3000. Subscription should be sent: in dinars to the Astronomical Observatory bank account No. 205-67803-88 (for Serbian Astronomical Journal), for foreign currency contact the Editorial office. Back-number price is $25 for single copy. Serbian Astronomical Journal is an Open Access Journal. All articles can be downloaded free of charge and are distributed under Creative Commons Attribution-NonCommercial-NoDerivatives 4.0 International (CC BY-NC-ND 4.0) licence. There is no publication i.e. Article Processing Charge (APC). The journal does not charge any fees at submission, reviewing and production stages. The authors are free to upload their preprints or postprints to open repositories such as arXiv. Serbian Astronomical Journal is indexed or abstracted in Astrophysical Data System (ADS), Clarivate Analytics' Web of Science and Journal Citation Report, Scopus, Chemical Abstracts, Referativni Zhurnal, EBSCO, SRJ SCImago, DOAJ, Serbian Citation Index (SCIndeks), DOISerbia.